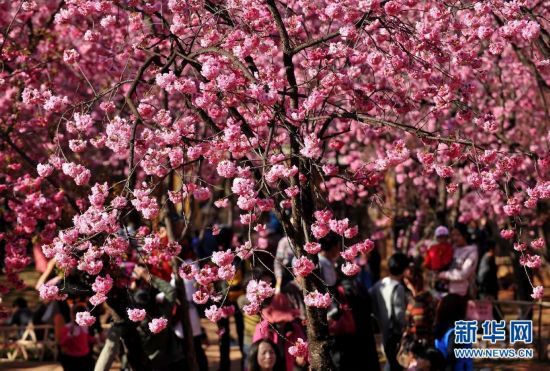 The 15th Cherry Blossom Festival kicked off at the Kunming Zoo on Feb 20. The festival will last until March 31. This year, the cherry trees and midget crabapple trees blossomed earlier than usual. Kunming is known as "the city of cherry blossoms on the plateau." The Kunming Zoo is reputed to be a sea of flowers, containing more than 800 Yunnan cherry trees, 1,200 hall crabapple trees, 100 Japanese sakura trees and 50 winter cherry trees. Covering 5,000 square meters, the flower district occupies one-fifth of the whole park. The Kunming Zoo intends to build itself as a park featuring cherry blossoms and plans to submit the Cherry Blossom on Yuantong Hill to the provincial-level heritage list of Yunnan, according to Yang Mei, director of the administration department of the Kunming Zoo. The 15th Cherry Blossom Festival kicked off at the Kunming Zoo on Feb 20. The festival will last until March 31.Photo from Xinhua.